Hi, everyone! Who likes hyaluronic acid? I know I do. Hyaluronic Acid does wonderful things for your skin. I received SANO Naturals Hyaluronic Acid Serum High potency Formula which is a Daily Moisturizing skin Revitalizer. The bottle is 1 fl oz/ 30ml and it is a glass bottle. You know the drill, I have to talk about the label. I just love labels especially ones with a lot of information. The front of the bottle has SANO NATURALS Hyaluronic Acid Serum + High Potency Formula. Daily Moisturizing Skin Revitalizer. The side of the bottle has the ingredients listed and just a warning all the warning says is keep out of the reach of children. For external use only. The other side of the label has some information about the product, it reads " Sano Naturals Hyaluronic Acid Serum+ penetrates the skin to deliver a mega-dose of potent botanical hyaluronic acid and anti-oxidants in the form of Vitamin C and green tea to deliver moisture to the skin,activate collagen production, and reveal a fresher, younger, firmer, brighter complexion." Then on the same side the directions are also listed. The directions are very simple to follow, it simply says to apply the serum after cleaning your face and apply the serum evenly all over face, neck and chest area. The bottle its self is very nice, it is a dark glass bottle with a dropper as the top. The dropper is also glass. I tested the dropper on my hand and it seemed to work fine. The product itself is a little thick in the bottle so it took me a couple tries to actually get some of the product in the dropper, once I did the dropper worked and I had no issues. As I said the product itself does look pretty thick once you open the bottle so I tested it on my had to start with. Once I had a few drops of the product on my hand it went on just fine it was smooth as a serum should be, in my opinion. I did feel a slight cooling sensation on my hand after rubbing it in but nothing major. The scent well it smells like hyaluronic acid, which typically doesn't have much of a scent. After I tested the product on my hand I decided to put it on my face to see how well it applied to my face. I have no complaints about how it went on. I did still feel the cooling sensation on my face as I did my hand, I kind of like that feeling though so it didn't bother me. I only needed about two full drops to cover my entire face and neck area so a little of this product goes a long way. 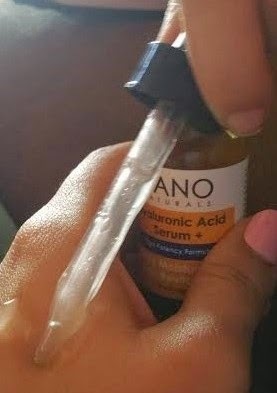 I really enjoyed this product and would recommend it if you would like to check out Sano Naturals Hyaluronic Acid Serum+ High Potency Formula on Amazon it goes for around $10.95 and is a prime item.